[Dave] wanted to show off a project at his 4th-grade son’s school during their family science night. We haven’t heard of an event like this before but it sounds like a fabulous idea! He had a new laser he wanted to include in the project, and noticed that his son was learning about how ASCII maps letters to binary number when the idea struck. He ended up building an optical data transfer system that demonstrates binary code. This presents a fantastic learning opportunity as the project invited the school kids to select encoded strips like the ones seen above to form a secret message. 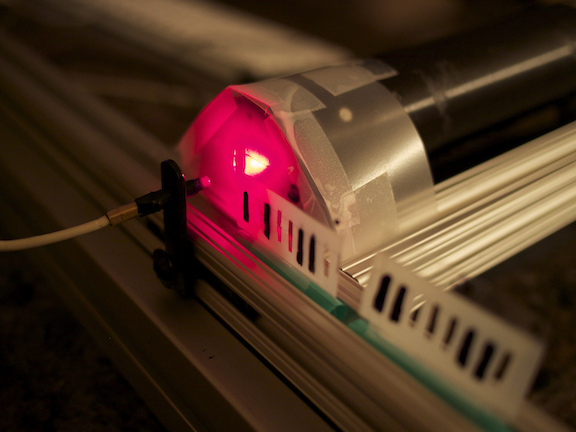 The laser is pointed at a photosensor which is being read by a Raspberry Pi board. The Python code looks for a baseline and then records increases and decreases in intensity. Since the translucent tokens have either holes or black lines for 0 and 1 the baseline approach does away with the need to clock in the data. [Dave] reports that everyone who tried out the experiment was fully engaged at the prospect of pushing pieces of tape through the sensor and watching their secret message appear on a monitor. 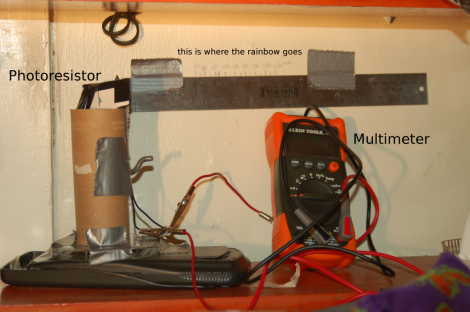 He was motivated to write about this project after reading about data transfer using an LCD screen and photosensor.